Sunday Session at Shenanigans ..
We are now in the final stages of putting the exhibition together and all work has been handed in from over 30 local creatives. Tristan, Paul & I have been overwhelmed by the positive response by everyone involved and the quality and breadth of work is pretty incredible. All the work featured in the exhibition will be for sale. There will also be some Strong Island goodies for sale – tees, stickers, tote bags and badges. The exhibition is open to the public at the Round Tower, Old Portsmouth from 16th April – 1st May. A shop is currently being made by Carl, Miguel and Oliver from Deer Park Alpha and this will feature work by Jodie Silsby, James Weaver, Badger Press, Bored of Southsea, French, aspex and many more including some of the exhibitors. 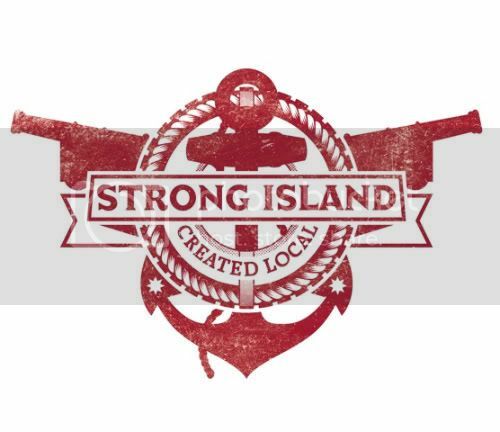 A Strong Island bike is being made by Stu Trett and Chris Borneo and All About Tea are developing a special Strong Island Tea. I can’t wait for this, another gallery opening up just around the corner! Someone spoke to me about this exhibition this morning. She had visited it and said it seemed to her to be work of children, not very good quality. She told me because she has seen my art and thinks mine is in a different league. I told her each artist is different and maybe it was just a children’s show, but it seems to have been open for all. Will you be doing any further exhibitions of art? I sell mine mostly to people in France, Canada, American, Italy and a few in UK. Hi Linda – this is the first negative comment that we have received from nearly 4,000 people that have visited the exhibition. Most of the creatives featured have international profile and have exhibited too. I am not sure what exhibition your friend saw? Have you seen it yet? There is opportunity to show work at the tower as the space is provided. You can either have this as a solo exhibition or a group show. It will be up to you to promote and organise though. Again I am pretty shocked to hear her comments.